Rockside was open for business for most of the First World War. In 1915, an advertisement in The Times read: "MATLOCK-Rockside Hydro; complete in own extensive grounds; near golf course; garage" and similar notices were published in the Derbyshire press until the end of June 1918. John Godfrey Goodwin, the proprietor of both Rockside and Rock Café, argued that his hydro was a health resort, so was of national importance in 1917, when he tried to retain his chef. Unsurprisingly, it wasn't easy to keep male staff. On the 9th February 1918 Mrs Eliza Goodwin, whose family had been associated with Rockside since 1894, died at the hydro. She was 84 years old. The family were to suffer a second bereavement just over a month later when Mr. Goodwin's eldest son, Godfrey John Whitehouse Goodwin, was killed in France. Only a few months afterwards a notice in The Times announced that "The Hydro Rockside, Matlock, has been taken over by the military authorities as a convalescent hospital for officers of the Royal Air Force". The hydro's owners had, seemingly, been given very little notice. The war was to end just under three months later but it wasn't until the following March that the military authorities vacated three Matlock properties - Rockside, Daysmill Hydro on Henry Avenue and the Cavendish School on Smedley Street. The latter two buildings had been used as auxiliary institutions. 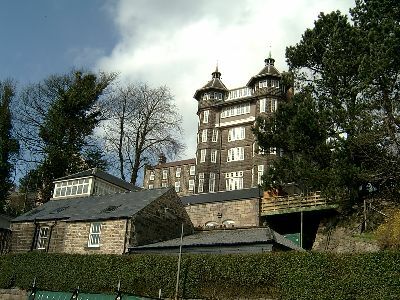 It was expected that Rockside would re-open as a hydropathic establishment under Mr Goodwin's management by the summer of 1919. It did not re-open until October as it had been redecorated and improved throughout and offered baths, golf and tennis. The baths on offer in 1920 were Modern Electric, Turkish and the "famous" Whirlpool Baths. 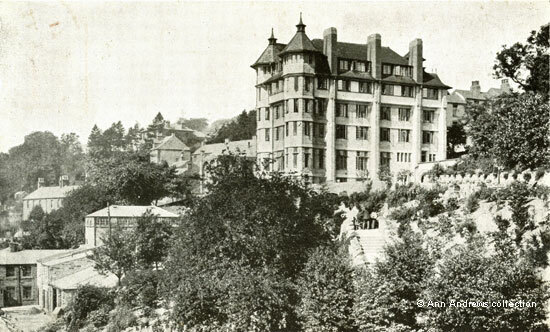 This postcard of the hydro (above) shows some buildings lower down the hill but within the grounds that border Wellington Street, as well as properties on both Rockside Steps and Cavendish Road behind the hydro. 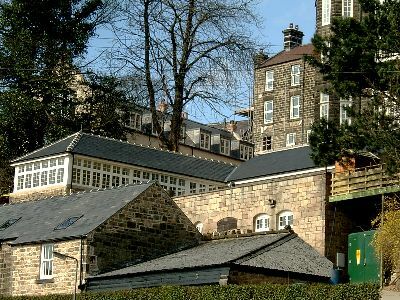 Rockside's rear extension, beside Rockside Steps, is also shown on the photo. There are two people standing at the top of the steps, sheltering under an umbrella or parasol - a man on the left and a woman on the right. Part of the postcard's caption reads "The carriage drive gives an easy gradient approach" yet the viewer cannot really see the drive! Below are two recent photographs of the south side of Rockside, taken in early April 2005, of the restored building. The newly built unit can be seen in the bottom picture of the two. Rockside, the Former Matlock Hydro has more photographs of the twenty first century restoration. "Rockside, Matlock.-View from South". No publisher provided but possibly printed for the hydro. Posted on 31 Aug 1917 at Matlock but dated 1 Sep! Sent to Mrs. Woolley at Branstone. The message reads: "Dear Auntie We have been having awful weather here, but has brightened up today & has been very nice. It is nice & sunny now". Another version of this card, also from an unknown publisher, is called "Rockside Hydro, Matlock. New Wing from South East". Postcard in the collection of, provided by and © Ann Andrews Intended for personal use only. Photographs from a private collection. "The Times", Monday, 24 May, 1915. Small advertisement for Rockside. "Derby Daily Telegraph", 27 June 1918. "The Times", Tuesday, 12 Feb, 1918. Announcement of the death of Eliza Goodwin, widow of John Goodwin, of The Wolds, Matlock, who died at Rockside. See Names on Matlock's War Memorial : WW1, Surnames A - J.
 Beresford, Charles (2007) "The Bath at War, A Derbyshire Community and the Great War". Country Books/Ashridge Press. ISBN 978 1 901214 91 8. "The Times", Monday, 26 Aug, 1918. News in Brief. The "Derby Daily Telegraph" of 19 August 1918 reported that" the first of the hydros at Matlock to be commandeered for the army is Rockside". They were right about it being commandeered, although they got the Service who was planning to use the building wrong. "Derbyshire Courier", 8 March 1919. Farewell R.A. F. Matlock Hydros vacated by military. "Derby Daily Telegraph", 23 October 1919. "Derby Daily Telegraph", 16 September 1920.